To build revenue, it is important to pave your own path to success, rather than replicate the paths of others. Therefore, what this book will do is walk you through the key affiliate marketing concepts, answering the most important questions, and equipping you with the information you need in order to chart your own road map for affiliate success. In a Q&A format, the book answers a total of 60 questions, providing you with a solid foundation for building a successful performance marketing business. – Which is the best network? – and much more Newbie’s dream come true!Answers to all those toss-in-your-sleep questions: – How do I get paid? – Do I need a website? – Which is the best network? – and much more…Keep this close-by your laptop while hammering out your next ad campaigns.Prussakov doesn’t sugarcoat the hard work & dedication it takes to become a successful AM.This is your keystone to lifelong profits! Read! Apply! Prosper! 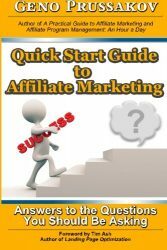 Geno Prussakov’s QUICK START GUIDE TO AFFILIATE MARKETING is the one book every aspiring affiliate publisher/advertiser needs to read, study and re-read to successfully enter and flourish in the vast and exciting world of affiliate marketing.Affiliate marketing is part science, part art. Prussakov demystifies it all in an easy-to-read, how-to guide that gives the reader background, insights, tips and specific steps in handling the challenges and rewards of affiliate marketing.Prussakov’s book is like your favorite textbook from college. Somehow you can never seem to part with it. This is that book. It’s worth reading over and over again – because it is the guiding light through the deep, dark tunnel of affiliate marketing in our enlightened digital age. This is NOT a get-rich-quick guide. This is what beginners should really be reading. It is not a get-rich-quick guide. There are no shortcuts in our business unless 1) you get incredibly lucky or 2) you fall in with a shady group of scammers. Neither are good for long-term success (and one may even get you in trouble). Working in the Affiliate Marketing industry is said to be more of a marathon than a sprint – and this guide will show beginners how to take those first steps.